Chinese Export Silver was very much a product of the China Trade, but the period between 1757-1842 is now known as the Old China Trade. Despite frenetic attempts by the Emperor to restrict European merchants, citizens and their trading to Macau, they began to infiltrate China. ‘The Canton System’ [Yī kǒu tōng shāng 一口通商, literally:”Single port commerce system”] was devised to control trade with the West within China while ensuring optimal tax and duty revenues to the Imperial treasury. As with all things Chinese, there was a structure and hierarchy, with the Emperor at the top of the pyramid and a complex array of officials and semi-officials beneath. Equally Chinese, if a system was devised and imposed to curb any activity that was essentially money-making in intent, the Chinese would generally find ways to circumvent it and the 19th century remoteness of Canton from Peking helped facilitate such activities. 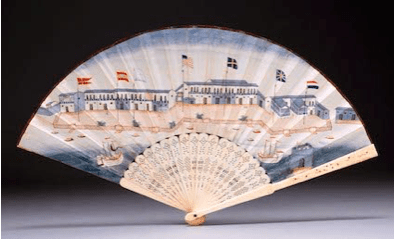 This spawned an astonishing array of complex working relationships that traversed top officials, Hong merchants, foreign merchants, private traders, ships’ commanders, ships’ crews and Chinese shop merchants. The Canton System had at its very foundation the Hong merchants [háng, 行]; no foreign traders could operate independently and were obliged to conduct any trade solely with one of the Cohong, the collective name for the guild of Hongs. Any trade, whether it be import or export, that was conducted via the Hong had a tax imposed upon it by the Hoppo [Imperial customs and excise agents] and the Governor General of Guangzhou and Guangxi [Viceroy of Liangguang or ‘Governor General of the Two Expanses’ 两广总督]. While in theory the system had a sound basis, It had an inherent flaw – namely the devious minds of both the Hong and the Western merchants. It was not for nothing the Chinese Court called the foreign merchants fan qui [foreign devils; barbarians], but the degree of honesty was always subjective on both sides. Certainly for the greater part of the first eighty years of the China Trade, it was the British who controlled any two-way trade with and from China by way of the British East India Company which was often, somewhat ironically, referred to as “The Honourable Company”. In that eighty years, the key British figures in Canton had developed a very keen British version of the Chinese mindset. 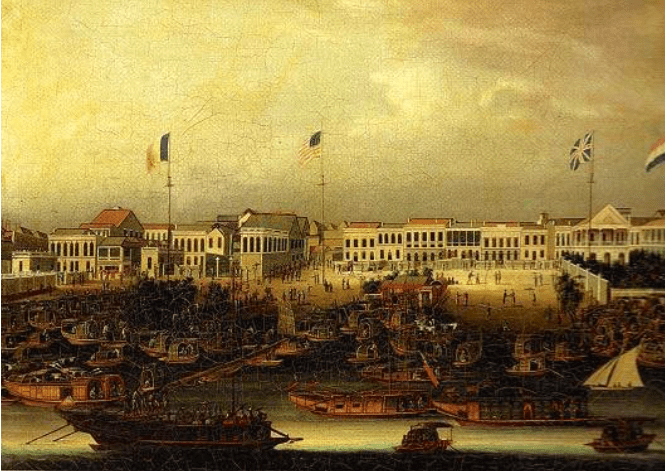 The complexities of the Chinese side of the China Trade cannot be viewed or understood objectively without acknowledging the presence in that complicated overall equation of the East India Company. This entity, that Queen Elizabeth I had the nousnous to create, was a uniquely English construct. In many ways, it had come into being way before its time, but when the China Trade came into being the East India Company had become a juggernaut. Such an unstoppable force meeting head on with China was tantamount to a collision. But the way the East India Company conducted its business was anything but quintessentially English. Probably the best way to describe the Company was that it had become adept at being a “mercantile chameleon”. It had achieved this in India, albeit in a more forceable way, and it managed to fit into the intricacies and foibles of trade in Canton almost as if it were the final jigsaw piece waiting to be looted into the puzzle. The intrigues and connivances of the various layers of Chinese officialdom and merchants were matched only by those of the East India Company and the British merchants who operated under its umbrella, many of whom were Scots. There developed a parallel trading channel to that of the East India Company that was devised in India and was known as the “Country Trade”. What began as the granting of licenses to private traders [free merchants] in India to transact on certain commodities to and from China that suited the East India Company not to be directly involved in, gradually grew into something much larger. This was, in effect, private trading to and from China. Often the Country Trade filled the vacant spaces on ships that would otherwise not have been fully laden and therefore paid a cheaper cargo charge. Country Traders were also granted a significant tax-free quota before import/export taxes began to apply. The shipping used was mainly their own privately-owned ships which were often obsolete Company ships; most of the free merchants had previously been servants of the Company in Europe. The Cohong [gonghang 公行] were focused on trade in around Canton, so gradually Chinese inland merchants’ agents [neidi shangren] began to connect with the Country Trade, which had the effect of funnelling trade between the European merchant and Chinese civilians. This kept growing and it was to eventually reach proportions that became an Imperial nightmare since it undermined the whole purpose of the Canton system. The word “hoppo” has passed into English slang but it is derived from the Chinese word hubu, short for yuehaiguanbu [the custom house]. Merchants were not allowed access or dialogue with the Emperor; the Hoppo and the Cohong were the effective Canton representatives of the Qing Court. 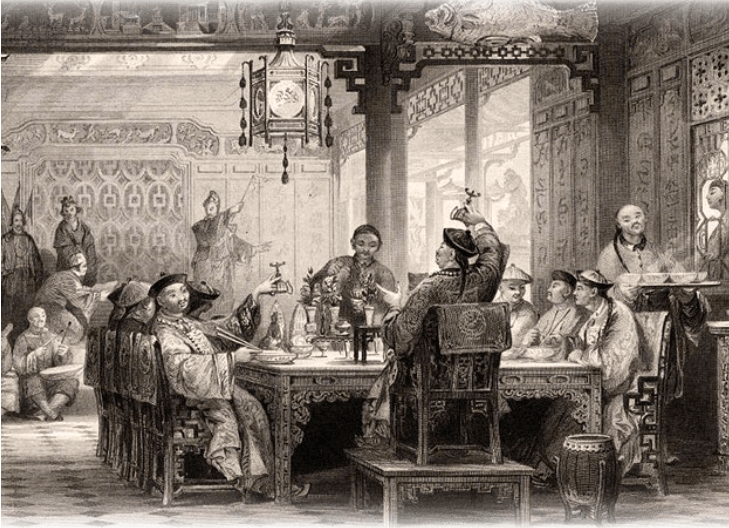 The Chinese Hong merchants developed close relations with their Western counterparts, instructing them carefully on how to conduct their business without antagonising the Chinese bureaucracy. This was the Cohong creating the ultimate opportunistic situation. The whole scenario was a recipe for organised chaos and corruption which somehow also provided the Emperor with sufficient taxes to appease him [or most of the time!]. One should not lose sight of the fact that a huge amount of trading was being carried out in virtually a tiny area of land in and around Canton and the Pearl River. Several other European trading nations and America gained varying degrees of foothold. Some of the established British merchants managed to be appointed as Consuls for other European countries, a cunning ploy since other trading countries would have been able to negotiate tax-free quotas which by slight of hand might be used by third party British merchants, many of whom happened also to head companies also under the control of the Consul! All were restricted to the relatively tiny piece of land outside of the city walls at Canton called “The Thirteen Factories”. Each foreign country had its own enclave [factory] and foreign workers and crews were allowed to stay in Macau during what was known as the “off season” when either the shipping winds were not favourable or ships were waiting for tea to reach Canton from the interior.. The merchants lived either in cramped living quarters on the upper levels of their warehouses or in even more cramped rooms in “hotels” bordering the compound, such as the legendary Marwick’s. Despite the cramped living accommodation, the food and entertainment of each factory were of a legendary grand scale. A hierarchy of foreign merchants at Canton evolved with the upper level acting for their own interests as well as acting as quasi-factors between the smaller “private merchants” and the Hong. Virtually all the top level foreign merchants were attached to trading houses. James Matheson became a partner of Yrissari & Co, one of the five principal agency trading houses in Canton at the time and a successful country trader in India. In 1827, Xavier Yrissari died and left his shares to Matheson and the company became Matheson & Co. Failing to find a suitable partner, he decided to dissolve the company and he joined Magniac & Co, one of the biggest of the “Big Five” where William Jardine was a partner. 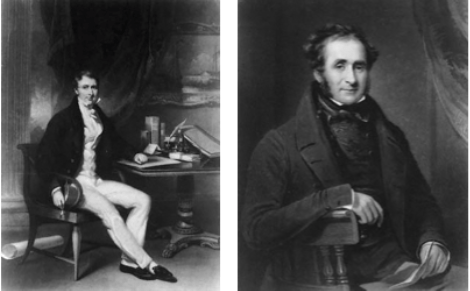 In 1832, Magniac & Co became Jardine, Matheson & Co, foreseeing the vacuum that was about to be created with the termination of the monopoly of the East India Company in 1834. This vignette into the frenetic power struggles that went on in Canton in what was a tiny piece of land demonstrates how cut-throat and relentless the China Trade was. The freneticism of Old Canton can only be imagined. It was not just confined to the overcrowding of the Pearl River with all sizes of ships and boats chaotically trying to load and unload and it wasn’t just confined to the maze of streets and alleys that pressed upon the backs of the foreign enclaves; a maze that grew more dense, narrow and chaotic the further away they were in that hierarchy of streets. The proximity of those streets and alleys to the “factories” compound made direct contact between foreign merchants and “shop” merchants [hangwai shangren] possible, even though it was technically forbidden. The freneticism was palpable in the air, with each Hong merchant and each foreign agent plotting and scheming ever more ways to engender profit and mitigate taxes, if not avoid them altogether. Canton and the China Trade was the ultimate cash cow; it was a constant battle of wits – wits that lay in two very different cultures. The actual 13 Factories compound land mass was only circa 65,000 sq metres [0.065 sq. km]. The “Old Factories” compound shown just 200 metres outside of the city walls [in red] with the streets and alleys of the Chinese traders and shops to the immediate left. 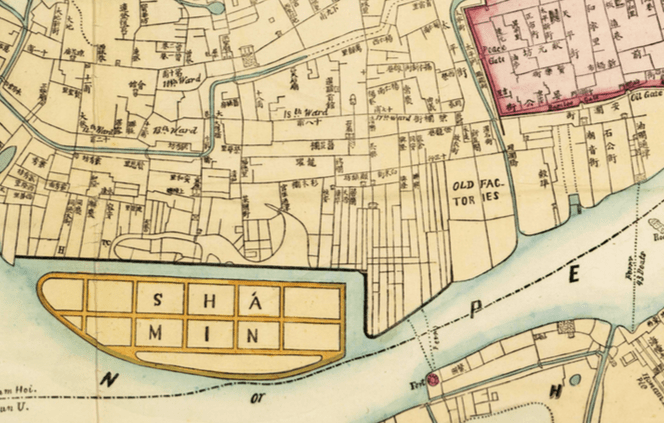 Shá min island eventually became the new location for the “factories” after the Treaty of Nanking in 1842 and is shown on this map with the original plots. The area above the island on the map is where many of the wealthier shop merchants lived. Immediately opposite the Old Factories site on the Pearl River is Honan – the home of most of the Hong merchants and Imperial officials. There is probably a misconception that trade, apart from the burgeoning opium trade, was very much a one-way affair. There was an additional trade from China to Britain that was known as the “Drug Trade” that began as early as 1800. What were known as “drugs” were surprisingly the following: cassia, camphor and rhubarb. The trade carried by “privileged tonnage” was so substantial that a “Drug Concern” was established in London – a partnership that handled and controlled the operation in Britain. It mainly remained the domain of private merchants. In return, certain goods, despite a general belief the Chinese wanted nothing from the West, were sent to China that included: lead, tin, Prussian blue and cochineal. 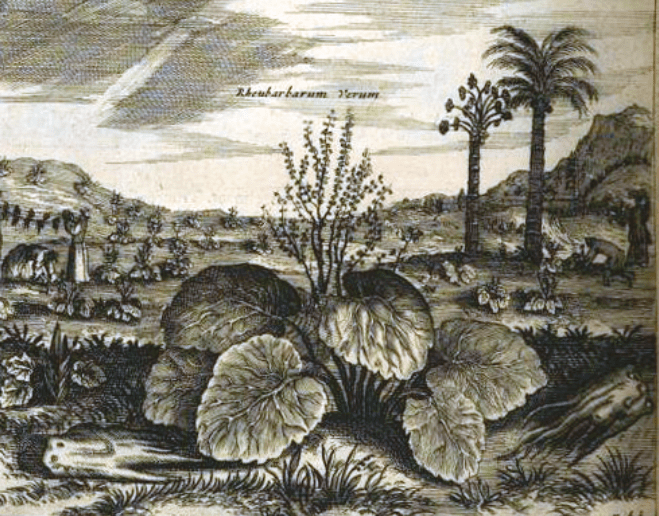 The East India Company bought the entire Chinese production of rhubarb that was brought to Canton. A vast quantity went onwards to England, while the finest quality was sent to St Petersburgh for the aristocratic Russian market, but via a Bukharan cartel present in Kyakhta in Russia, the treaty port for the China-Russia trade. In addition there was a rather strange commodity that wealthy Chinese and members of the Imperial Court had an addiction for; it was known by the Chinese as “singsongs”. Singsongs, a pidgin word, were automatons, musical clocks and musical boxes! The Chinese couldn’t get enough of them and would pay anything to own British versions of them. In the region of £100,000 worth were dispatched to Canton each year for the first decade of the 19th century. This had a “street value” of around £1 million in China; a relatively small but highly lucrative trade. The Drug Trade and the singsong trade were all handled by private traders on both East India Company and private vessels. But things were to become even more bizarre; the “Drug Trade” and the singsong trade were so significant that forward trading bills were issued in London and traded as an actual commodity until the market changed – many fingers were burned in the demise. A whole variety of other goods were brought into China either by the Honourable Company or the Country Trade, goods including cutch [an astringent medicinal resin from the Indian Acacia], olibanum [frankincense], myrrh, elephant ivory, sharks’ fins, coromandel wood, ebony, sandalwood, coral, amber, mother o’ pearl, tortoiseshell, copper, bêche de mer [sea cucumber – used smoked or dried in soups], betel nuts, rattan and peppercorns. Sealskins, otter skins and furs were brought in from North America in huge volumes, initially via Britain and later in the 19th century by American merchants. 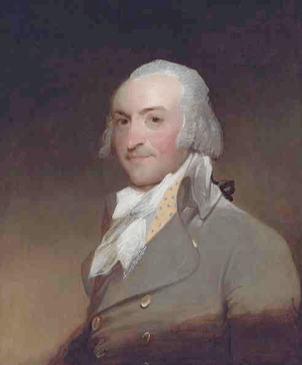 This trade was highly profitable, making the German émigré American John Jacob Astor [born in Waldorf in Germany Johan, Jakob Astor] $20 million dollars [equivalent to an astonishing $1.3 billion today] by the time he died in 1848. Astor was the first multi-millionaire in American history and founder of The American Fur Company – he was also one of the main importers of Chinese silks into America. Nankeen was a sturdy cotton cloth that was used for making Chinese trousers among other things. It was not uncommon for the cotton harvest to be poor for the making of Nankeen. At the Manchester cotton mills a similar fabric was made from cotton brought in from the British colony of India and this was made in the same yellowish buff colour that Nankeen was produced in and exported to China. 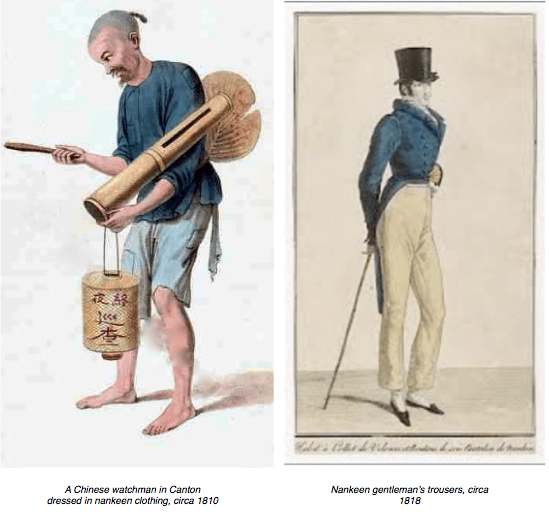 Nankeen was also used to make fashionable summer weight trousers for the well-dressed Regency gentleman, who considered Chinese nankeen far superior. The reason why British dusting cloths are yellow today are because in the late Georgian and Victorian periods old Nankeen garments were cut up and used as polishing cloths! Nankeen was sent to China in huge quantities; one House of Lords journal for the year 1813 relates to 800,000 bales being sent to Canton. It became a particular merchandise that was foisted on the Chinese merchants upon threat of reducing or withdrawing the overall level of trading of Chinese exports and the supply of opium. It became clear from the outset of the China Trade that Chinese silversmiths could produce silver as fine as the best English and American Georgian silversmiths. Silver, as a commodity, was cheaper in China and the labour was a fraction of the cost. However, initially any purchasing has to be via the auspices of the Hong merchants. 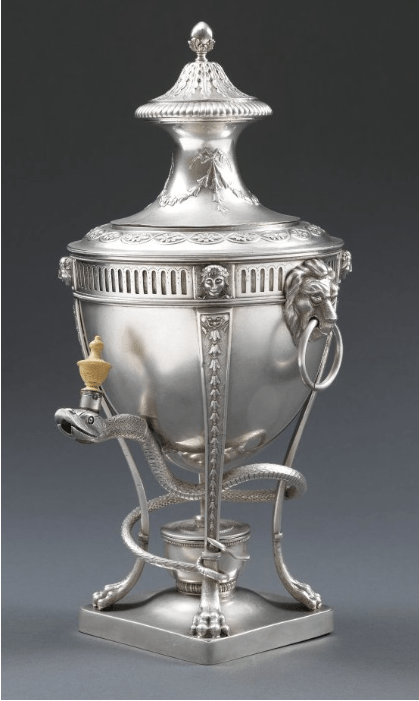 The only true “export” silver, inasmuch as it was made specifically for shipment to England and America, happened in the latter part of the 18th century and endured through to around 1840. This consisted almost entirely of silver in the neo-classical style and the phenomenon was the result of a shortage of raw silver from the South American mines because of civil unrest as a result of the growing striving for independence in Mexico. China, because it had stock piled silver ingots for centuries, found itself in a position to supply high quality decorative silver their English and American counterpart silversmiths could not afford to make as a result of the extortionate price of raw silver. A superb example of neo-classical silver tea urn created in Canton circa 1825 for the English trade. The Canton shop merchant Linchong was responsible for selling the item, as the silver mark attests. It was most probably a special commission made from drawings or it could have been a copy of a piece of English silver used at the British Factory – the merchants dined in splendour each day and their entertaining was legendary. This is true Chinese export silver. Of all the various trades that made up the China Trade as a whole, opium is not a trade that can be overlooked, neither should it. While with the benefit of hindsight one might pass judgement on what is now generally held to have been an evil and underhand trade, there was an additional and quite considerable trade to the West in opium that was never destined for backstreet opium dens. Since the 18th century, it was possible to walk into the equivalent of todays pharmacy and buy opium and opium derivative drugs without the requiring a prescription. In provincial towns in England, across Europe and in America, such drugs were sold in market places and by street hawkers. Many of the so-called patent medicines of the 19th century contained an opium derivative and this also applied to medicines given to children and infants. 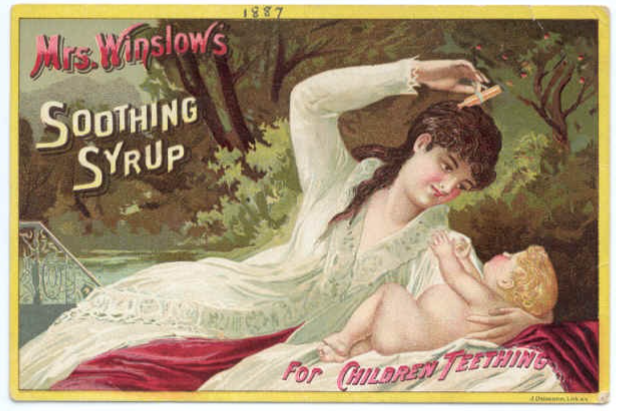 “Mrs Winslow’s Soothing Syrup” circa 1885, was used for teething babies and was widely used by child-care workers of the later part of the 19th century. It contained 65mg of morphine sulphate per fluid ounce. Needless to say, it was high effective in quietening restless and fretting children! Vapor-ol was a highly volatile liquid that was placed in a pan over a table-top kerosene burner. The ensuing vapours were designed to give relief for the “spasmodically affected”. The opium content is plainly advertised on the packaging and was available freely. 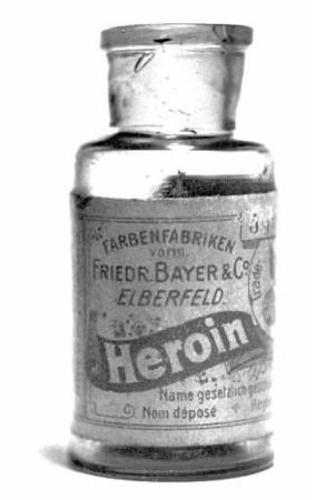 The 21st century pharmaceutical giant Bayer as a young company in Wuppertal in Germany in the late 19th century, built its foundation for future growth upon “Heroin” – a cough suppressant, maintaining it was a better and safer substitute for morphine and codeine and, more importantly, cheaper. Heroin is otherwise known as diacetylmorphine. In England, in 1876, a London doctor highlighted an issue to the medical journals of the day. The then compulsory vaccination against smallpox wrote to all mothers of babies whose births had been registered inviting them to come and have their babies vaccinated. With the letter was this flyer [right],giving an impression it had “royal” endorsement. 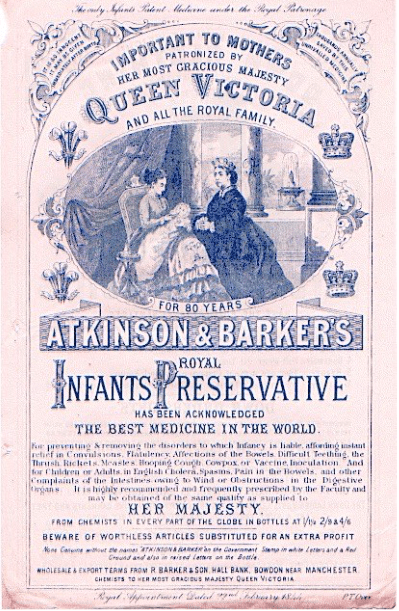 When Atkinson & Barker began this promotion, they sent a supply of “Royal Infant Preservative” to her Majesty. The opium trade to China had effectively begun in the late 17th century and the Company had the monopoly under charter. 18th and 19th century trade up until 1873 between China and India was governed by the East India Company since it was tasked with managing and ruling colonised India on behalf of the British monarchy. The East India Company had its own military and navy that had grown to 280,000 men by 1857. 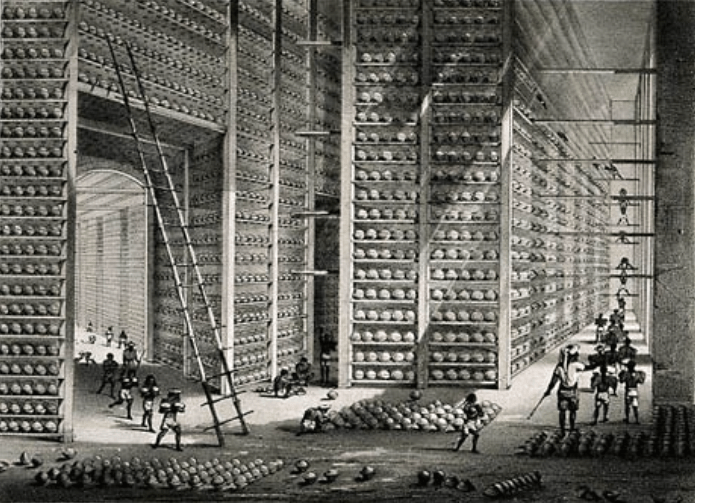 One of several such opium warehouses the English East India Company operated in Calcutta. Opium balls were sorted packed into chests that then went to the auction house. This is where the opium parted company from the “Honourable Company”. Country traders bought the opium and shipped it to China in their own ships, absolving the East India Company in theory. 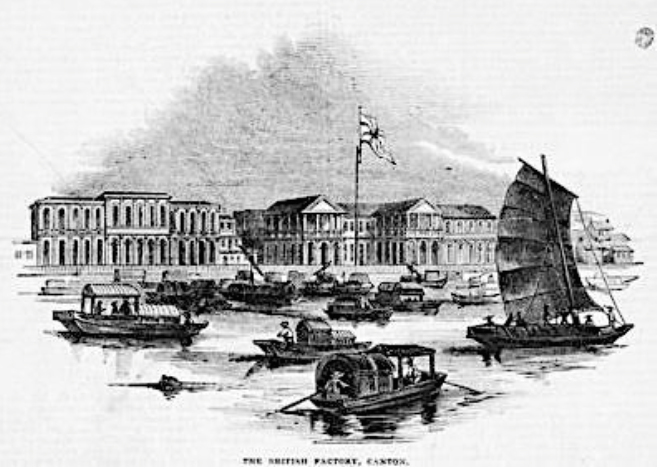 The trade in opium had grown to such an extent by the late 18th century that the East India Company, fearing it might use its license, switched to auctioning the opium in their Calcutta headquarters to ‘independent’ traders; there was a purpose-built bourse in Calcutta where auctions for opium and tea were held. The newly-sold opium was then shipped in vessels owned by ‘country traders’. The East India Company absolved itself of direct blame yet maintained total control and the vast majority of the profits. The country traders comprised mainly of Parsees and Jews and were as wily as the Chinese merchants. Country ships were soon found smuggling opium into China along the eastern coast; not wishing to return with empty vessels, goods from the interior of China were funnelled through these merchants, in particular tea. This was the ‘country trade’ but it is necessary to understand that it could not have existed without the complicity of the Hong merchants and the entirety of the complex China Trade network in Canton. After the Treaty of Nanking in 1842 and the ceding of Hong Kong as a crown colony to the British, Hong Kong fast became became one of the greatest opium import hubs. Much of the raw opium was processed and refined into chandu or smokable opium. Labourers broke the opium balls in half and scooped out the gelatinous mass within. A series of extraction processes ensued, resulted in a substance that resembled treacle. In Hong Kong this was carried out on an industrial scale. The combination of freneticism and the sheer volume of trade in tandem with devious minds and varying degrees of greed eventually began to take its toll on the Hong merchants themselves. By far the most shrewd was Houqua; he was also a master of networking and was becoming vastly wealthy, while staying relatively immune to the knocks and shocks of voluminous trading, much of which was speculative. Other Hong merchants did not fare so well, many getting severely into debt. It was in the interest of the British and the Hong that the status quo should be maintained. 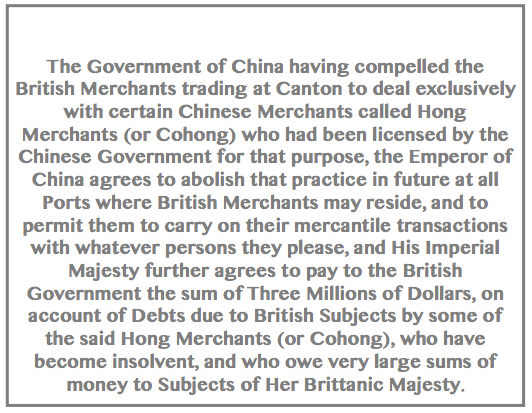 The British government actually passed Acts of Parliament that created substantial loans to help keep the Hong merchants solvent. Houqua himself also contributed and the balance required was raised by the Parsi Indian merchants working in parallel to the East India Company. The Parsi merchants were to remain very much part of the equation in the China Trade until the Treaty of Nanking created the various treaty ports; the Parsi merchant dynasties of the Banajis, the Dadiseths, the Kamas and the wonderfully named family, the Readymoneys, were all headed by Sir Jamshedji Jijibhai. After the Treaty, they were joined by the Bombay and Calcutta Jewish merchant families; the Khadoories, the Hardoons and the Sassoons, with David Sassoon being titular head. The Parsis took advantage of the American Civil War and concentrated their energies on the cotton and cloth trades with Manchester in Britain. The bailing out of the Hong merchants put the latter in an unenviably weak position with the British, but devious minds are often the mother of invention – it is best to say that some highly ingenious ways were found that were beneficial to all parties involved, except for the Imperial Court! Houqua remained virtually the only Hong merchant to stay solvent, attaining the eventual status of “the wealthiest man in the world”. Another reason it was deemed necessary to keep the incumbent Hong merchants’ heads above water was the practice of the Imperial Court to banish bankrupt merchants to a solitary life of poverty. It was a case of the “devil you know rather than the devil you don’t know” for the British and even Houqua. Between 1828 and 1836 the British brought $4,307,000 worth of silver into China. In that same period, the British received $42,392,103 worth of silver for their “trade”, amounting to an astounding net export of $37,985,103 from China. This is exactly what “inspired” the Acts of Parliament that endeavoured to ensure the Hong debts were guaranteed and nullified. Between 1840 and 1850 there were far more Chinese silversmiths operating in Canton and making decorative silver, some of it specifically for export, some for the Chinese home market and the vassal states semi- dependent on China. Until this time all trade by the foreign merchants, whether it be import or export, still had to be conducted through the Hong merchants. The Country Traders, the foreign and private merchants and even the ships’ captains were now more open in venturing into the nearby streets – Old China Street, New China Street and the alleys that lead from them and they bought directly from the silversmiths. This had the added benefit of purchases being exempt from taxes. Many of the silver shops also dealt in other luxury goods and some extended their merchandise offering by having a back room where “other goods” might be acquired. This new state of affairs attracted new retail silversmiths to appear near to the foreign “factories” that were keen to take advantage of what was essentially a new form of trade, albeit technically illicit. The obvious increase in trading resulted in more manufacturing silversmiths setting up workshops in the vicinity. Understanding any Chinese phenomenon is complex. The consensus of opinion today, particularly by the Chinese, is that the makers’ marks we find on Chinese Export Silver are invariably the names of retail silversmith or merchant shops. My own research, particularly into the English journals of the late 18th and early 19th centuries paint a slightly different picture. As an example, the maker Cutshing – an old house that was famous for being purveyors of fine luxury items of silver, silver gilt, carved ivory, lacquer wares and jade. Cutshing and comparable contemporaries such as Lin Chong were actually manufacturing many of their own items in their own workshops. The House of Carl Fabergé in St Petersburg would be a good comparable – Fabergé maintained a showroom at the front of the premises at 24 Bolshaya Morskaya Ulitsa. Behind and above the showroom were the workshops where regular clients could enter and discuss new commissions with the artisans; this was the same model that Cutshing operated at their New China Street and his later Old China Street premises. There is evidence that Cutshing was one of the houses that supplied the Russian Imperial Court. The mushrooming of merchant shops taking advantage of the foreign buyers infiltrating the previously out of bounds streets created a new dynamic. A period began where we see names such as Wang Hing & Company appearing. It is recorded the firm of Wang Hing began life as jade traders in Foshan, now a western suburb of Guangzhou. The company had a reputation for quality and authenticity. Foshan was traditionally also the home of many silversmiths and their workshops. These establishments were retail showrooms that were more akin to Western emporia of the time and were supplied by separate workshops populated by artisan silversmiths. A house name such as Wang Hing would develop a style and a level of quality that became synonymous with that house, the quality control being exercised strictly by the shop owner. In certain instances, some of the workshops were also owned exclusively by the house, others were either independent or may have been family relatives of the house proprietor. 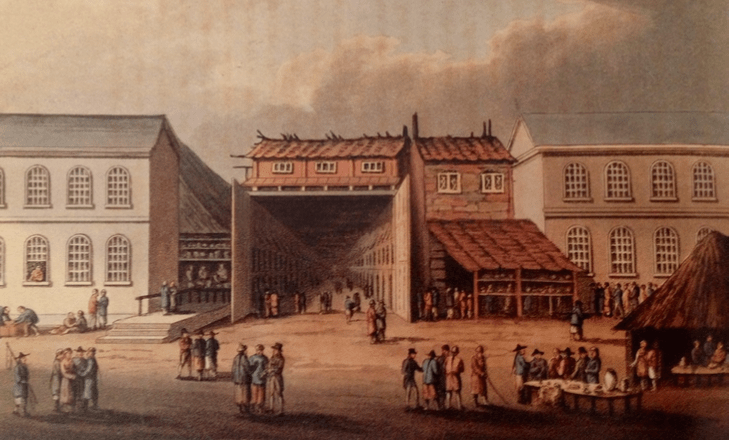 A few workshops of the late 18th and early 19th centuries were actually owned by Hong merchants or were partnerships of Hong, Chinese and foreign merchants – a way for the Hong merchants to be compensated for not receiving commission payment on transactions. It was not uncommon for workshops to rent bench space to itinerant artisan silversmiths. After around 1840 ,the artisan silversmiths began to stamp their own chopmark on pieces they were responsible for and it was not an uncommon for the same artisan and chopmark to appear on pieces under different shop names, indicating that some artisans may have worked benches in several workshops for different merchant houses. The artisans were all master silversmiths as the West would recognise, working incredibly hard and being paid relatively low for such highly skilled work. This was the prevailing system despite the existence of trade guilds in Canton. This was all a product of highly complex corruption that was chaotic, unpredictable and multi- layered, yet it was a system of sorts and it worked for all concerned, the Emperor excluded. Foreign traders had to factor all this into an ever-changing trading landscape. Not only were there known payments and taxes to be paid, but there were payments that had to be made in order to turn a blind eye as it were. These were known collectively as cumshaw – a pidgin phrase derived loosely from the Xiamen Chinese – kam siā meaning “grateful thanks”. The act of requesting cumshaw was also known as ‘squeeze’ – another pidgin expression meaning “stealing profits”. In 1807, a ship of 300 tons with 30 crew that stayed for 3 months on shore paid in the region of $2600 for cumshaw. It was only the lucrative export trades from China that made the whole system worthwhile for all concerned. Chinese Export Silver may have been small relative to the tea and opium trades, but it was immensely profitable. One could best refer to it as “economic ballast” for the ships. It was virtually impossible to transact anything in China without encountering the need for “squeeze”. This remained the status quo until the Treaty of Nanking in 1842 threw open the doors to Canton. This resulted in Shamien Island becoming the new foreign “factories” site, just 250 metres west of the old site. It was leased to the British who in turn auctioned leases for the valuable parcelled trading sites to various nations, America being the largest, second to Britain. The British profited well from this initiative in terms of real estate transactions, but it was also the beginning of an unequal treaty that was for the first time highly unfavourable for the Chinese. So ended the Canton System. The new treaty laid down detailed regulations for Sino- British trade and specified the terms under which Britons and other nationalities could reside and trade freely in the newly opened ports of Shanghai, Ningbo, Xiamen, Fuzhou and Canton in designated “international areas”. This created a re-arrangement of the trading furniture as it were; the British became effectively the new Cohong by being granted Most Favoured Nation status not exclusively in Canton but also the other treat ports. In addition, the British now had the new Crown Colony of Hong Kong to develop. The need to dock at Whampoa had been removed which also heralded the gradual demise of Canton as the principle port of the “new” China Trade era. It is important, however, to always remember that silver making in China had already a long tradition of 1200 years by this time – it was not a exclusively a bi-product of the China Trade; as a definitive silver category Chinese Export Silver, it came towards the end of a long heritage. The Cohong disbanded and either retired or acted as consultant facilitators [executive compradores] to foreign merchants except for Houqua who continued his close relationship with American merchants. Houqua’s great success was at least due in part to his friendship with the influential Boston merchant clan but the Bostonians owed Houqua at least as much. Not only did he aid every family representative who came to China, he continued to favour some long after they returned home by investing money in American ventures in partnership with them. Houqua owned 10% of Russell & Company, a company that invested heavily in railroads including the Philadelphia, Wilmington and Baltimore Railroad and railroads from Chicago to the Mississippi. Houqua died in 1843, one year after the Treaty. 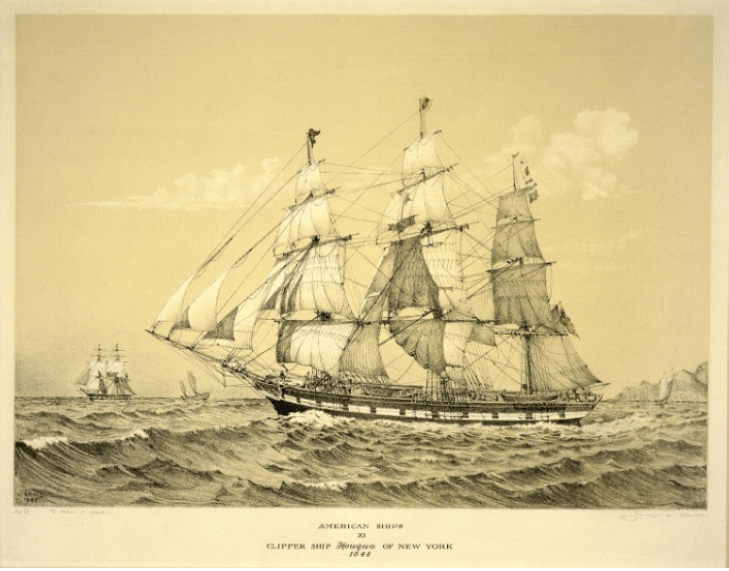 A clipper ship was built in New York and named in his honour in 1844. Some of the silversmiths during the early manufacturing periods of Chinese Export Silver were very much in league with the Hong Merchants who in turn were in league with the foreign merchants based in Canton as well as the sea captains. 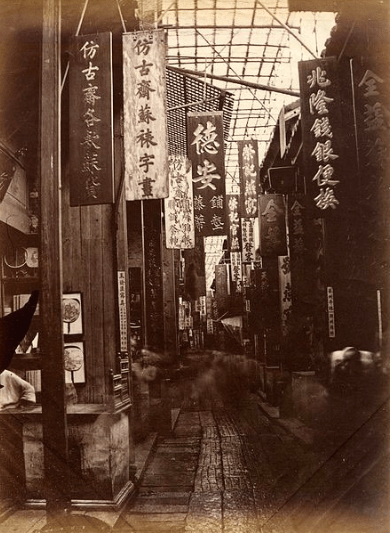 We know of joint ventures between Hong merchants and foreign merchants and it is generally believed there was a somewhat incestuous situation of shop merchants being in a “gentleman’s agreement” type of partnership with various levels of officialdom of the Canton System. In the frantic world of Canton, in particular, this would have seemed both natural and inevitable. It is clear how labyrinthine the trade was and, more importantly, the actual artisan silversmith that worked an item were very much at the bottom end of the food chain unless they were one of the few artisans who rose to celebrity status and were sought by many of the shop merchants. By western standards the workshops would have been operating on an almost treadmill routine. Much has been written about the merchants of the China Trade, but the trade itself would not have happened had it not been for the immense number of ships that plied the routes to and from China. In the 18th century, the commanders, officers, supercargoes and often the sailors working for the East India Company had permission to conduct a certain amount of private trade in goods to and from China. As with the East India Company’s “country trade”, this trade became known as the “privilege trade” and it was considered an essential part of a mariner’s stipend of all ranks, if you will. By the end of the 18th century a captain of a clipper or East Indiaman ship could expect to earn £10 a month, the sixth mate £2,50 and the purser or surgeon even less than the cook who was already at the bottom end of the hierarchy. Supercargoes were paid a nominal salary as well as receiving commissions on the value of the cargo from and to China, generally in the region of 3% of the cargo value excluding silver or gold. They also were granted a small stake in the company’s stock value and they had permission to have silver to the value of between £100-£150 in order to buy goods in Canton – amounts of money that had considerable spending power in Canton at the end of the 18th century. The so-called “private trade” is rarely mentioned, yet the reality of it was that it first of all increased the volume of trade and there are a significant number of instances where the private trade accounted for more than half of the actual company’s imports to China. The system the companies ran was constructed in such a way that the private trade imports into China actually helped finance the company’s exports through an ingenious system of certificates or bills of exchange on the company that were payable in London using an exchange rate that was favourable to the officers and crew. This created a source of funding to aid the company to acquire goods at Canton. In the 20 years 1775-1795, in excess of £500,000 of funds were available, accounting for 3% of the company’s expenditure in Canton. The most significant factor of this arrangement was the company was absolved, in the main, of dealing with what it considered to be the “minor trades”, allowing it to concentrate on the important, high-yield merchandise. This rule applied in both the outbound and inbound trade. In the context of if the “Silver Trade”, this had significant implications. Where one might have assumed without giving it much thought that Chinese decorative silver items were exported as simply “ballast merchandise”, it is easy to see that it was the officers and even the seamen who not only were the true engine that largely created this trade, but they were also responsible for having developed sophisticated business acumen both in Canton and back in Britain – in today’s speak, one would regard this as “networking”. Even with the favourable financial benefits that were available to them, many of the officers, seamen and even the supercargoes could not always raise sufficient funds to attain their optimum allowances. It became commonplace that friends and family “invested” as a consortium, but more importantly, wealthy individuals as well as retail silversmiths also were quick to see the benefits of not only investing, but also placing orders for specific items. 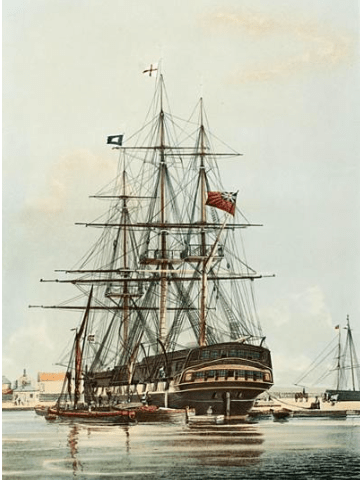 With an overview of the 60 years of British sailing ships trading between 1780-1840 within the China Trade, one is looking at one-third of the world’s total merchant fleet, accounting for in excess of 1 million tonne cargo capacity on the British side alone. The ballast displacement of an average clipper ship averaged 12% of its useable cargo space, approximately 200 tonnes per vessel. 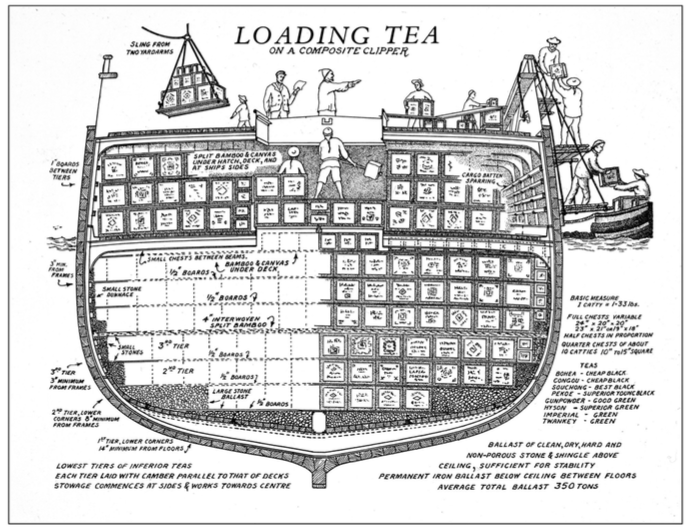 The same hierarchy on board each East India Company ship were allotted their own individual allowance of tea, the amount being incrementally larger or smaller according to rank. This has to be viewed in the context that a tea clipper could hold some 40,000 chests of tea, each containing 140lb [63.50 kilos]. A chief mate on a ship had allowance of 3 chests, the second mate 2 chests. The average cost price of tea in Britain at the end of the 18th century was 4 shillings a pound, making the value of a chest £28. This was a considerable amount of money; at the same period a curate in England would expect to earn £30 a year, a labourer, at best, £1 a week, more likely to be 11 shillings. It is important to remember that ballast cargoes were necessary for both outward and inward journeys. In the context of the China Trade, among the China-bound items were clothing and cloth, jewellery, drugs, dyes various household items and a variety of objets d’art. 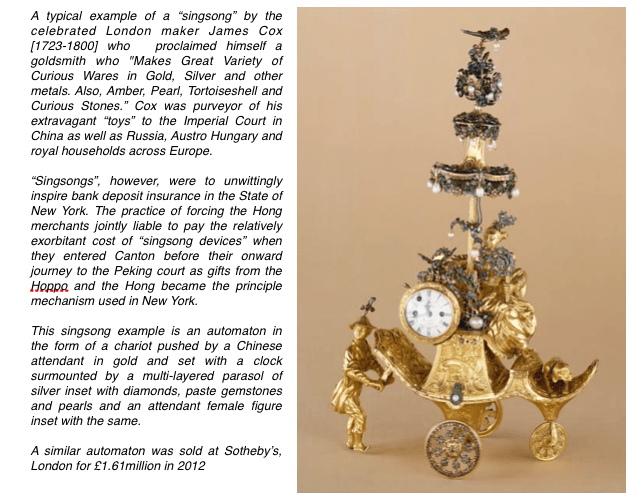 In the latter category was a highly lucrative and somewhat bizarre merchandise – “singsongs” [aka mechanical automaton clocks, musical boxes etc]. Returning cargoes included raw silk and fine silk cloth, Chinese porcelain, lacquerware, furniture, paintings, fans, nankeen cloth, musk, sugar, sugar candy, rhubarb, china root [wild yam – an anti-spasmodic], camphor, borax, alum [used in pickling and baking], sago and cowrie shell. In addition, cargoes always included metals and metal goods that included copper, Paktong [tutenage], mercury and gold. Lastly, there were the decorative Chinese silver items and this is how the majority of so-called Chinese Export Silver came to Britain, as it did to America and to all the European countries that were involved in the China Trade. It should be also remembered that despite the high volume that made up the China Trade as a whole, rarely did a vessel journey fully-loaded. This, in principle, created more space for private trade goods, but it also presented the commander with an ever-expanding or contracting equation to determine how much ballast and ballast cargo was required to ensure a safe passage. The system that had evolved within the East India Company and had been tried and well tested became the accepted norm on most sailing vessels plying the China Trade route. If ship owners did not offer the same, it found it nigh impossible to adequately crew the ships without the threat of insurrection. In many ways the various trading methods that resulted in laden ships both to and from China mirror the somewhat convoluted network that constituted the trading arena at Canton and this is no more truer than the Chinese silver trade. What the private trader phenomenon highlights is that a sailor was often far more than just that, just as a ship commander could be more than he seemed. Just as what can best be described as highly creative entrepreneurialism was rife in Canton, the same developed among the private traders. 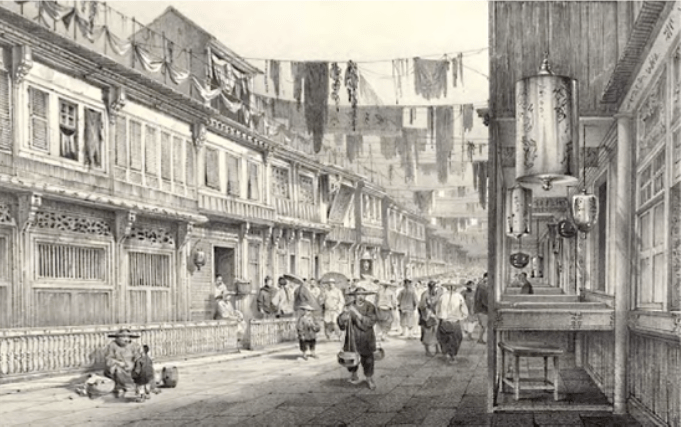 In Canton they were able to develop highly keen relationship with artisan silversmiths and shop merchants in Old and New China Street and the numerous alleys and outhouse buildings that lay off them. 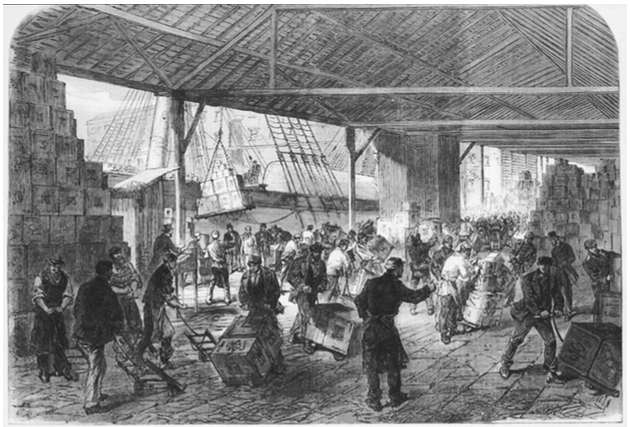 It was not uncommon for crews to be left waiting in China for several weeks or even months either waiting for favourable winds or simply for the main cargoes to arrive from the interior of the country – tea, after all, depended on crop picking and processing as well as travelling a considerable distance overland to Canton. Before the Treaty of Nanking, ship’s crews had to stay at the port of Whampoa, between Macau and Canton. While crew could not be in Canton, there were odd occasions when they were allowed, but they also formed working relations with the numerous Chinese men who made it their business to service the various requirements of the visiting crews. Communication was conducted using “pidgin” a wonderful broken English construct of a language also known as “Chinese Coastal English” or by the even more wonderful Chinese name of “yáng jìng bāng yīng yǔ” [洋泾浜英语]. “How many dollars is that?” becomes “how muchee dollar” [口乜治打鎼 háu màt jih dá làh]. Pidgin was very much a part of the rich micro-ecology that made up the day-to-day mechanics of the China Trade. While it was technically forbidden for foreigners to mix with the Chinese population, informal as well as illicit contact did take place, sometimes brokered by compradors who were present in Whampoa. Both the Chinese and foreign crew members of all ranks developed keenly honed communication links and it was perfectly possible to achieve almost anything in Canton from Whampoa, even to having a shop merchant or his representative visit in order to take or deliver orders. With regards to the silver trade, perhaps the most relevant fact in this complex phenomenon is that a highly keen sense of quality and style was developed among the crew members dealing in this commodity. Apart from possibly some of the commanders, few of the crew were well educated and few would have been familiar with silver objects in their earlier lives. It is believed that some silversmiths did supply drawings and detailed specifications for special orders, while private placers of orders might have given sample silver to copy. This certainly could have applied during the 60 or so years that neo-classical silver was produced in Canton. With regards to the later silver styles that were decorated with traditional Chinese motifs, we are aware of notes passed to commanders or crew members asking for more of a certain items because it sold well. The already over-burdened equation probably contained cunning methods of mitigating the hoppo tax when goods left Canton to be loaded. During the 19th century, Chinese silver and botanical specimen plants formed a curious marriage with Chinese silver inasmuch as it became a highly lucrative cargo that was mainly the domain of the private traders. 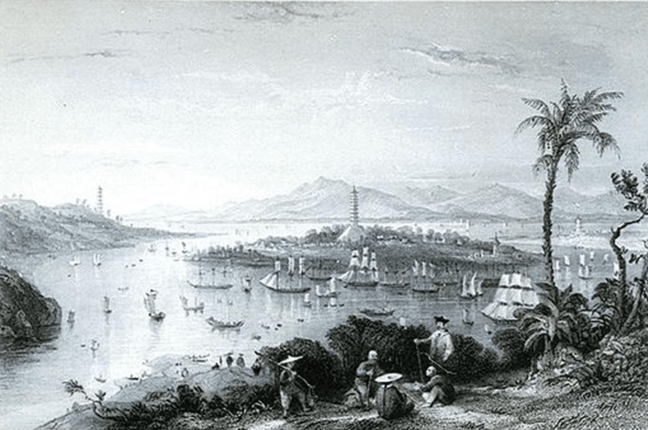 While foreigners were not allowed to enter China beyond the foreign trading area of Canton a rather unexpected yet steady trade went on by British and American horticulturalists coming to Macau and Canton to find exotic plants that were native to China. This developed into a two-way trade since the Chinese love of plants had them eager for new species from Europe and America and a willingness to pay handsomely for that privilege. Many of the plants one takes for granted have their origins in China; plants such as over six hundred examples of rhododendron, azalea, over one hundred and fifty varieties of primula, lilac, wisteria, chrysanthemum, buddleia, iris, hollyhock, aster, japonica, hydrangea and camellia are just a few of the many plants one thinks of today as being quintessentially English or American. Many of these plants were given a Latin name with the tell-tale suffice ‘chinensis” – “rosa chinensis” we know more commonly as the Tea Rose.The Chinese, meanwhile, benefitted either from the occasional enterprising horticulturalist and even seamen from being introduced to plants such as the antirrhinum [snapdragon]. In the early 19th century, several high profile botanists came to China on a quest for new species. Since it was forbidden for foreigners to enter China beyond the confines of the Canton trade area, some enterprising botanists managed to form relationships with equally enterprising Jesuit missionaries that were allowed into the interior. This, though, was a limited and often time consuming conduit. It is recorded that a very few Westerners did manage to disguise themselves as Chinese, having first mastered the language, but this was highly dangerous in many respects. However, on Honam Island. The other side of the Pearl River opposite the foreign concession area on tiny Shamien Island, was a huge nursery known as Fa-Te [flowered lands]. This became the centre of the highly significant and under-heralded trade in horticultural specimens. Botanists and horticulturalists as well as painters who specialised in botanical depiction carved special relationships with the Chinese gardeners at Fa-Te, opposite Shaman Island on the Pearl River. Several of the Hong merchants held a genuine interest in rare plant species, the merchant Consequa in particular was known to be responsible for propagating Wisteria and the first two plants that were brought to England in 1816. 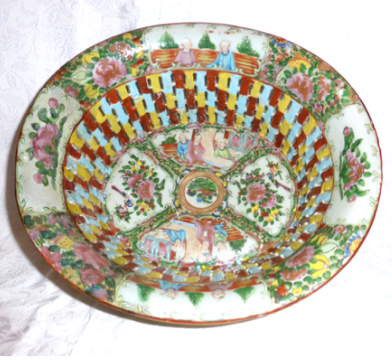 The well-known Canton glass and silk painter Tinqua was very involved in what became the “botanical trade”. As these trades evolved they bolstered the financial viability of the China Trade in general and since many of the peripheral trades were dependent on the private traders, it emphasises how important these traders were. While the 1834 lifting of the East India Company monopoly caused an initial influx of private traders, the vast majority of the trade was conducted by ships’ officers and crew. It has to be recognised how extraordinary this phenomenon was given that many of them were uneducated, yet they managed to acquire and develop an extremely finely honed entrepreneurial ability. This also highlights the fact that each ship’s cargo represented a highly complex financial equation that allowed both the ship owners and all those manning the ship to optimise revenues. Since much of the Chinese silver that came to Britain obviously did not get assayed on arrival, it is questionable how this may have happened. If silver was part of an East India Company cargo, ships would have been met by company “waiters” who were tasked with checking there was no contraband goods on board – there were even surveyors of the waiters. 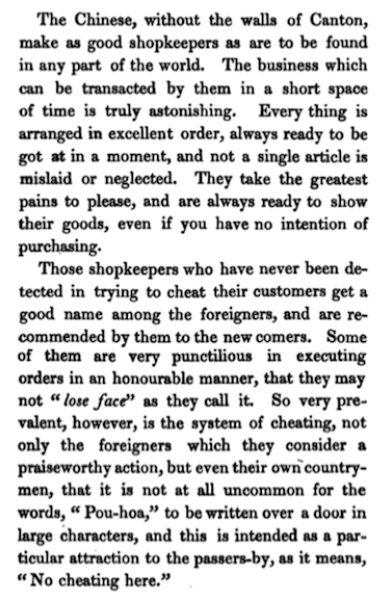 The numerous minutes of House of Commons Select Committees that focus on the East India Company, it has to be said appear to contain an overriding presumption that Company warehouses and the merchandise stored in them were secure and above board. Privately owned ships were not put under this initial scrutiny. Certainly in the late 18th and early 19th century it was possible to gain access to the London, Glasgow or Liverpool docks and mingle in the mayhem of ships that were unloading. Dock workers were a fraternity and customs officials another; the two did not really mix or at least not officially. Hierarchy is one of the operative words that sum up the China Trade and this also applied to the world the artisan silversmiths operated in at Canton. Chinese society has a centuries old hierarchical structure that is so rigid that it makes it extremely difficult for successful individuals whose profession placed them in the lower ranks. Success and money did not move a merchant up the social ladder. The same was applicable to a successful artisan silversmith. It is clear how labyrinthine the trade was and, more importantly, the actual artisan silversmith that worked an item was very much toward bottom end of the scale. If they were one of the few artisans who rose to celebrity status and were sought by many of the shop merchants, their social status still remained the same. Contrary to general belief, not all the so-called Chinese export silver was destined for the West – some went to India, Arab countries, other south east Asian countries and the silver that was sent there was very much designed to suit regional and religious tastes. A significant amount was also sought after by affluent Chinese, some of whom aspired to a more Western lifestyle which was certainly the case in Shanghai and Hong Kong and to some extent in Nanking and Tientsin. After the various treaties and the creation of the ‘treaty ports’ the pace of growth of affluence among the Chinese grew considerably. This was a totally new phenomenon for Chinese society and it certainly conflicted with the long-held social structure that had existed for centuries. In parallel to this, international settlements housed a significant growing number of foreign businessmen and entrepreneurs who were there to make money. The reality was that after the 1842 Treaty of Nanking, the vast majority of silver produced in China and Hong Kong remained there. “Canton1860” by D. Vrooman – hHp://www.nla.gov.au/apps/cdview/nla.map-lms636. Perdue, Peter C. China Marches West: The Qing conquest of Central Eurasia. Cambridge, MA: Belknap Press of Harvard University Press, 2005. Adrien von Ferscht understands the mind-set of Chinese business people. This article is required reading for anyone who wants to do business in China. Never mind the article is about events of 200 years old. Never mind it is about Chinese export silver. His analysis of the Chinese and their business culture is psychologically precise and relevant today.